서평은 책을 비판적으로 평가한 보고서입니다. 책 속의 여러 측면에 대해 설명하고 있지만, 요약과는 다르다는 점을 기억하시길 바랍니다. 리뷰에서는 책의 분석, 책에 대한 견해에 초점을 맞추어야 하고 독자가 이 책을 읽을지 말지를 결정하는 데 도움을 줄 수 있어야 합니다. 서평을 쓸 때는 다음 단계를 따릅니다. 1. 책에 관한 사전 정보를 목록화합니다. 책을 읽기 전에, 책의 제목만을 보고 그 책이 전달하려는 것이 무엇인지 생각해 봅니다. 저자의 경력, 책의 배경, 저자의 집필목적 등에 관해서도 알아봅니다. 서문을 상세히 읽어보는 것도 이런 정보를 얻는 데 좋은 방법입니다. 2. 책을 정독합니다. 읽으면서 내용, 스타일, 구조, 짜임 등에서 받은 인상을 메모로 남깁니다. 3. 정독 후에는 전체적인 시각에서 생각할 수 있도록 책을 천천히 이해하는 시간을 가집니다. 4. 하나의 전반적 인상을 적어 봅니다. 이것을 바탕으로 중심 이론을 세웁니다. 중심 이론은 보통 저자의 집필 목적이 무엇이며 그것을 얼마나 이루었는지를 중심으로 펼쳐집니다. 그러므로 평론가는 저자의 목적 성취 성공 여부를 판단하는 역할이라고 할 수 있습니다. 5. 메모해둔 내용으로 돌아가 위의 전반적 인상과 일치하는 내용이 무엇인지 확인합니다. 중심 이론과 관계없다고 느껴지는 것은 모두 지웁니다. 6. 이 부분이 명확해지면 서평의 첫 번째 초안을 작성할 준비가 되었습니다. 하지만 그보다 먼저 개요를 작성해두는 것이 좋습니다. 이렇게 개요를 써놓으면 서평을 쓰면서 계속해서 참고할 수 있습니다. 서론 문단에 저자의 이름, 책 제목, 책의 장르, 저자에 관한 간단한 정보, 책의 주제, 저자가 이 책을 쓴 목적 등을 씁니다. 본론 문단에서는 주요 이론을 논리적으로 펼쳐 나갑니다. 이때 평가하는 입장에서 책이 좋았는지, 좋지 않았는지를 쓰고 그 이유를 설명합니다. 여기서 내용, 스타일, 구조 등에 관한 분석을 제시합니다. 문단 하나마다 주요 이론을 뒷받침하는 아이디어 하나씩을 배정하는 것이 좋습니다. 책에 대한 요약을 제시할 수 있지만, 독자가 책을 직접 읽었을 때 새로운 정보를 얻지 못할 수 있으므로 책의 내용을 너무 많이 공개하지 않도록 조심합니다. 결론 문단에서는 책에 대한 평가자의 전반적인 인상을 제시합니다. 이때 주요 이론을 요약하거나 책에 대한 최종 판단을 내릴 수 있습니다. 이 부분에서는 새로운 내용을 추가해서는 안 됩니다. 마지막으로 초안을 수정합니다. 수정 시에는 다음 내용을 기억하세요. 1. 핵심 의견들이 명확해야 합니다. 모든 핵심 의견은 주요 이론을 뒷받침해야 합니다. 2. 반복과 중복표현을 피해야 합니다. 강조하기 위해 똑같은 의견을 반복하지 마세요. 하나의 의견을 제시한 뒤 그 중요성을 설명하세요. 3. 어색하거나 불분명한 문장이 없는지 확인하고 있다면 다시 작성합니다. 필요한 경우 짧은 문장들로 쪼개어 씁니다. 4. 일관성이 있어야 합니다. 각 문장과 문단은 자연스럽게 다음 문장과 다음 문단으로 이어져야 합니다. 5. 마지막으로 맞춤법 오류를 검토합니다. 이제 여러분은 서평을 출판할 준비가 되었습니다! <h2>서평 (Book review) 쓰는 법</h2><br><p style="margin:0cm 0cm 8pt"><span style="font-size:11pt"><span style="line-height:107%"><span style="font-family:Arial,sans-serif"><span style="font-family:&quot;맑은 고딕&quot;"><span style="color:#212529">서평은 책을 비판적으로 평가한 보고서입니다. 책 속의 여러 측면에 대해 설명하고 있지만, 요약과는 다르다는 점을 기억하시길 바랍니다. 리뷰에서는 책의 분석, 책에 대한 견해에 초점을 맞추어야 하고 독자가 이 책을 읽을지 말지를 결정하는 데 도움을 줄 수 있어야 합니다. </span></span></span></span></span></p><p style="margin:0cm 0cm 8pt"><span style="font-size:11pt"><span style="line-height:107%"><span style="font-family:Arial,sans-serif"><span style="font-family:&quot;맑은 고딕&quot;"><span style="color:#212529">서평을 쓸 때는 다음 단계를 따릅니다. </span></span></span></span></span></p><p style="margin-left:11.0pt; margin:0cm 0cm 8pt"><span style="font-size:11pt"><span style="line-height:107%"><span style="font-family:Arial,sans-serif"><span lang="EN-GB" style="font-family:&quot;맑은 고딕&quot;" xml:lang="EN-GB"><span style="color:#212529">1. </span></span><span style="font-family:&quot;맑은 고딕&quot;"><span style="color:#212529">책에 관한 사전 정보를 목록화합니다. 책을 읽기 전에, 책의 제목만을 보고 그 책이 전달하려는 것이 무엇인지 생각해 봅니다. 저자의 경력, 책의 배경, 저자의 집필목적 등에 관해서도 알아봅니다. 서문을 상세히 읽어보는 것도 이런 정보를 얻는 데 좋은 방법입니다. </span></span></span></span></span></p><p style="margin-left:11.0pt; margin:0cm 0cm 8pt"><span style="font-size:11pt"><span style="line-height:107%"><span style="font-family:Arial,sans-serif"><span lang="EN-GB" style="font-family:&quot;맑은 고딕&quot;" xml:lang="EN-GB"><span style="color:#212529">2. </span></span><span style="font-family:&quot;맑은 고딕&quot;"><span style="color:#212529">책을 정독합니다. 읽으면서 내용, 스타일, 구조, 짜임 등에서 받은 인상을 메모로 남깁니다. </span></span></span></span></span></p><p style="margin-left:11.0pt; margin:0cm 0cm 8pt"><span style="font-size:11pt"><span style="line-height:107%"><span style="font-family:Arial,sans-serif"><span lang="EN-GB" style="font-family:&quot;맑은 고딕&quot;" xml:lang="EN-GB"><span style="color:#212529">3. </span></span><span style="font-family:&quot;맑은 고딕&quot;"><span style="color:#212529">정독 후에는 전체적인 시각에서 생각할 수 있도록 책을 천천히 이해하는 시간을 가집니다.</span></span></span></span></span></p><p style="margin-left:11.0pt; margin:0cm 0cm 8pt"><span style="font-size:11pt"><span style="line-height:107%"><span style="font-family:Arial,sans-serif"><span lang="EN-GB" style="font-family:&quot;맑은 고딕&quot;" xml:lang="EN-GB"><span style="color:#212529">4. </span></span><span style="font-family:&quot;맑은 고딕&quot;"><span style="color:#212529">하나의 전반적 인상을 적어 봅니다. 이것을 바탕으로 중심 이론을 세웁니다. 중심 이론은 보통 저자의 집필 목적이 무엇이며 그것을 얼마나 이루었는지를 중심으로 펼쳐집니다. 그러므로 평론가는 저자의 목적 성취 성공 여부를 판단하는 역할이라고 할 수 있습니다. </span></span></span></span></span></p><p style="margin-left:11.0pt; margin:0cm 0cm 8pt"><span style="font-size:11pt"><span style="line-height:107%"><span style="font-family:Arial,sans-serif"><span lang="EN-GB" style="font-family:&quot;맑은 고딕&quot;" xml:lang="EN-GB"><span style="color:#212529">5. </span></span><span style="font-family:&quot;맑은 고딕&quot;"><span style="color:#212529">메모해둔 내용으로 돌아가 위의 전반적 인상과 일치하는 내용이 무엇인지 확인합니다. 중심 이론과 관계없다고 느껴지는 것은 모두 지웁니다. </span></span></span></span></span></p><p style="margin-left:11.0pt; margin:0cm 0cm 8pt"><span style="font-size:11pt"><span style="line-height:107%"><span style="font-family:Arial,sans-serif"><span lang="EN-GB" style="font-family:&quot;맑은 고딕&quot;" xml:lang="EN-GB"><span style="color:#212529">6. </span></span><span style="font-family:&quot;맑은 고딕&quot;"><span style="color:#212529">이 부분이 명확해지면 서평의 첫 번째 초안을 작성할 준비가 되었습니다. 하지만 그보다 먼저 개요를 작성해두는 것이 좋습니다. 이렇게 개요를 써놓으면 서평을 쓰면서 계속해서 참고할 수 있습니다. </span></span></span></span></span></p><p style="margin:0cm 0cm 8pt"><span style="font-size:11pt"><span style="line-height:107%"><span style="font-family:Arial,sans-serif"><span style="font-family:&quot;맑은 고딕&quot;"><span style="color:#212529">첫 번째 초안에 들어가야 할 내용:</span></span></span></span></span></p><ul><li style="margin:0cm 0cm 8pt 40pt"><span style="font-size:11pt"><span style="line-height:107%"><span style="font-family:Arial,sans-serif"><span style="font-family:&quot;맑은 고딕&quot;"><span style="color:#212529">서론 문단에 저자의 이름, 책 제목, 책의 장르, 저자에 관한 간단한 정보, 책의 주제, 저자가 이 책을 쓴 목적 등을 씁니다.</span></span></span></span></span></li><li style="margin:0cm 0cm 8pt 40pt"><span style="font-size:11pt"><span style="line-height:107%"><span style="font-family:Arial,sans-serif"><span style="font-family:&quot;맑은 고딕&quot;"><span style="color:#212529">본론 문단에서는 주요 이론을 논리적으로 펼쳐 나갑니다. 이때 평가하는 입장에서 책이 좋았는지, 좋지 않았는지를 쓰고 그 이유를 설명합니다. 여기서 내용, 스타일, 구조 등에 관한 분석을 제시합니다. 문단 하나마다 주요 이론을 뒷받침하는 아이디어 하나씩을 배정하는 것이 좋습니다. 책에 대한 요약을 제시할 수 있지만, 독자가 책을 직접 읽었을 때 새로운 정보를 얻지 못할 수 있으므로 책의 내용을 너무 많이 공개하지 않도록 조심합니다.</span></span></span></span></span></li><li style="margin:0cm 0cm 8pt 40pt"><span style="font-size:11pt"><span style="line-height:107%"><span style="font-family:Arial,sans-serif"><span style="font-family:&quot;맑은 고딕&quot;"><span style="color:#212529">결론 문단에서는 책에 대한 평가자의 전반적인 인상을 제시합니다. 이때 주요 이론을 요약하거나 책에 대한 최종 판단을 내릴 수 있습니다. 이 부분에서는 새로운 내용을 추가해서는 안 됩니다.</span></span></span></span></span></li></ul><p style="margin:0cm 0cm 8pt"><span style="font-size:11pt"><span style="line-height:107%"><span style="font-family:Arial,sans-serif"><span style="font-family:&quot;맑은 고딕&quot;"><span style="color:#212529">마지막으로 초안을 수정합니다. 수정 시에는 다음 내용을 기억하세요.</span></span></span></span></span></p><p style="margin-left:11.0pt; margin:0cm 0cm 8pt"><span style="font-size:11pt"><span style="line-height:107%"><span style="font-family:Arial,sans-serif"><span lang="EN-US" style="font-family:&quot;맑은 고딕&quot;" xml:lang="EN-US"><span style="color:#212529">1. </span></span><span style="font-family:&quot;맑은 고딕&quot;"><span style="color:#212529">핵심 의견들이 명확해야 합니다. 모든 핵심 의견은 주요 이론을 뒷받침해야 합니다. </span></span></span></span></span></p><p style="margin-left:11.0pt; margin:0cm 0cm 8pt"><span style="font-size:11pt"><span style="line-height:107%"><span style="font-family:Arial,sans-serif"><span lang="EN-US" style="font-family:&quot;맑은 고딕&quot;" xml:lang="EN-US"><span style="color:#212529">2. </span></span><span style="font-family:&quot;맑은 고딕&quot;"><span style="color:#212529">반복과 중복표현을 피해야 합니다. 강조하기 위해 똑같은 의견을 반복하지 마세요. 하나의 의견을 제시한 뒤 그 중요성을 설명하세요. </span></span></span></span></span></p><p style="margin-left:11.0pt; margin:0cm 0cm 8pt"><span style="font-size:11pt"><span style="line-height:107%"><span style="font-family:Arial,sans-serif"><span lang="EN-US" style="font-family:&quot;맑은 고딕&quot;" xml:lang="EN-US"><span style="color:#212529">3. </span></span><span style="font-family:&quot;맑은 고딕&quot;"><span style="color:#212529">어색하거나 불분명한 문장이 없는지 확인하고 있다면 다시 작성합니다. 필요한 경우 짧은 문장들로 쪼개어 씁니다. </span></span></span></span></span></p><p style="margin-left:11.0pt; margin:0cm 0cm 8pt"><span style="font-size:11pt"><span style="line-height:107%"><span style="font-family:Arial,sans-serif"><span lang="EN-US" style="font-family:&quot;맑은 고딕&quot;" xml:lang="EN-US"><span style="color:#212529">4. </span></span><span style="font-family:&quot;맑은 고딕&quot;"><span style="color:#212529">일관성이 있어야 합니다. 각 문장과 문단은 자연스럽게 다음 문장과 다음 문단으로 이어져야 합니다. </span></span></span></span></span></p><p style="margin-left:11.0pt; margin:0cm 0cm 8pt"><span style="font-size:11pt"><span style="line-height:107%"><span style="font-family:Arial,sans-serif"><span lang="EN-US" style="font-family:&quot;맑은 고딕&quot;" xml:lang="EN-US"><span style="color:#212529">5. 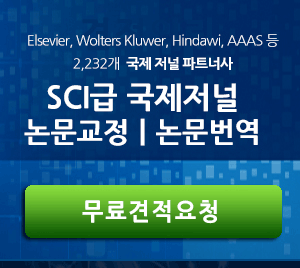 </span></span><span style="font-family:&quot;맑은 고딕&quot;"><span style="color:#212529">마지막으로 맞춤법 오류를 검토합니다. </span></span></span></span></span></p><p style="margin-left:11.0pt; margin:0cm 0cm 8pt"> </p><p style="margin-left:11.0pt; margin:0cm 0cm 8pt"><span style="font-size:11pt"><span style="line-height:107%"><span style="font-family:Arial,sans-serif"><span style="font-family:&quot;맑은 고딕&quot;"><span style="color:#212529">이제 여러분은 서평을 출판할 준비가 되었습니다!</span></span></span></span></span></p><p style="margin:0cm 0cm 8pt"> </p><p style="text-align: justify;"> </p></br><br><a href="https://www.editage.co.kr/insights/how-to-write-a-book-review">서평 (Book review) 쓰는 법</a>는 <a href="https://www.editage.co.kr/insights/">에디티지 인사이트</a>에서 제공되었습니다.